Existing utilities for monitoring apache logs didn’t suit me, so I’ve decided to create a tool for monitoring apache log files remotely via a browser. 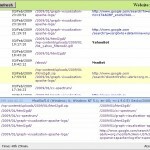 The aim was to create a very small application that just do the job: show the last visits to a website and nothing more. The tool is called ALiveLog (Apache Live Log): you can monitor multiple websites hosted on the same server through a single ALiveLog installation. Regarding security, the script performs only read operations (reading the last N entries from access.log files). The server side script is written in Perl, but can be easily ported to PHP as well. Only the access.log will give you a 100% accurate picture of how visitors are browsing your site. 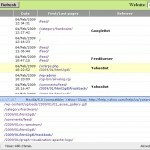 I recommend AWStats: a free log analysis tool that generates nice reports out of your access.log. However, AWStats is focused on general usage reports per day/month/year and doesn’t offer an handy way to see the recent activity on your site. But sometimes I need a real time report that shows the last 10/20 visits to my website. Moreover, if I have a couple of websites hosted on the same server, I need to easily switch from one website to another. Such a long prologue finally brings us to the core. I’ve written a small utility that consists of a server side perl script and a frontend JS application that communicates via AJAX with the script. The script fetches the last entries of an apache access.log, group entries of the same visitors (by IP) and attach the GeoLocation information to the data. 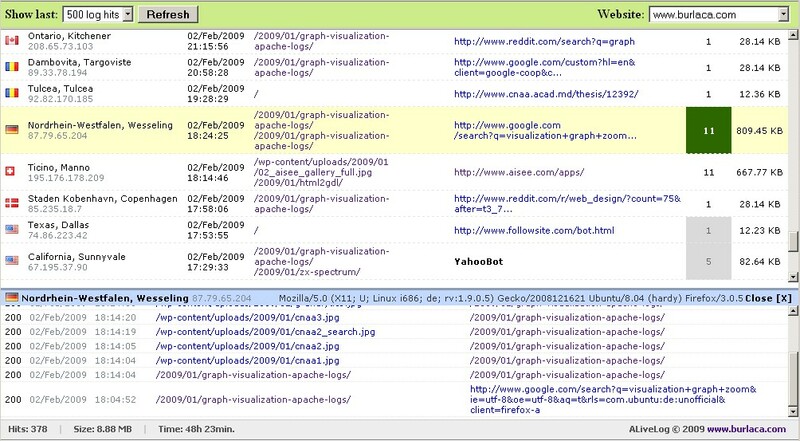 The hits from search engine bots (for ex: Google, Yahoo, MSN ) are also displayed but using a gray color to visually differentiate them form normal human visits. A visitor session will be colored in red if at least one hit was not successful (for ex: the server returned 404 Not Found or 500 Server Internal Error). The package also contains the jquery_131.js: the jQuery library v.1.3.1. It has an Install.txt file inside. The script doesn’t have a login/password feature yet, so you should use .htaccess to restrict the access to it. The Geo::IP perl module is needed if you want to see the visitor’s location (country/city). (Notice that you should also install the GeoIP C Library). After that download the GeoLite City database and decompress it to /usr/local/share/GeoIP/GeoLiteCity.dat. In an attempt to minimise the number of files used, I wanted to concatenate all country flags into one big image, I found the Montage utility. It is a part of ImageMagic package. Here is how I’ve managed to obtain one big file from 247 small country flags. The problem is that after concatenation, the image had a white background instead of a transparent one. On row hover, the flags were surrounded by some white space. I think that the number of countries from the recent log hits will be small, and the benefit of having one big image will not improve significantly the loading speed of the front end application. While writing this post I remembered that I should check the app in Internet Explorer (I’m using FireFox and Google Chrome occasionally). Hmm, I was very disappointed by IE… When the number of rows exceed the grid capacity, the grid will expand below the footer, and you’ll not be able to see the bottom rows. At the same time, the window that appears when clicking on the number of entries will not be displayed correctly.I’ll try to dig a little, maybe I’ll find the correct CSS solution to this problem. At least I was happy to find out that it works ok in Google Chrome. This entry was posted in Web on February 5, 2009 by admin. I have to give you praise for this wonderful tool. By watching the traffic on my little website and I am excited over it. However, I noticed that some things act differently (or did not act). Web robots are never labeled with another color and name as it appears on your image. 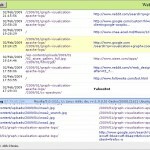 Not shown is also information on the web browser and it has never shown Referrer. Any idea? You apache logs doesn’t feature referrer information, as stated in the post, “Don’t forget to use the combined log format. Verify that you httpd.conf file has the following line:” … notice the LogFormat and CustomLog apache directives. Thank you for your quick response. You’re right. I forgot to remove a comment before the line in httpd.config. Now all works fine. Thank you for your help. your script has a bug. if i browse one of the logged hosts from my local area network (and there is a entry with local ip (192.168.100.123) … your script doesnt show anything! i’ll try to fix that for my own – should be difficult because i cannot code perl… but you should fix that also – it did cost me hours of finding that. anyway – thanks for your simple and nice script.